Shanghai, unlike New York, Paris or London, is one of those holiday destinations people do not always agree upon. However, I was quite excited last May to visit once again this bustling city where seven years prior I had had the opportunity to both live and work. As a passionate retail designer, I have found very few places in the world that integrate changes in consumption trends so quickly. And once again, this visit did not disappoint! I was blown away with the transformations that have taken place in the mere four years since my last visit. The key one being the proliferation of WeChat Pay, my local friends now all relying almost solely on their phones to do, well… everything: shop, eat, pay, work and socialize. The widespread adoption of this new shopping tool has forever transformed the way locals live, which in turn has led to changes in both the retail and service sectors. Clearly, China is changing and fast! This, of course, represents a massive challenge for brands, but also… an opportunity. How international names adapt to local markets has always intrigued me. China is particularly interesting because of the need to identify and make changes so quickly. Whilst living there I had already identified a few retailers that were innovators in the way they addressed this challenge, Starbucks being one of the most memorable ones. Unlike many, I was thus, not surprised to hear of the opening of “the biggest Starbucks in the world” in Shanghai end of last year. Where else, I thought, could they fully “push the envelope” and still be guaranteed success? Still, my interest had been “picked” and a visit of this flagship was thus high on my priority list. Despite the many articles I had read, the store experience not only lived up to, but exceeded expectations. I was blown away with how well the brand has managed to rework its entire positioning through both a stunning store design as well as a unique offer. As mentioned above, Starbucks has always been one of those brands I kept an eye on whilst living in Shanghai. When I first moved there in 2009, I was quite surprised to see just how present the coffee company was in this Asian market, one which traditionally has such a strong tea culture. I soon realized the appeal of the brand locally was not so much its star product but rather a combination of its positioning as a “luxury” brand and its ability to address the locals’ tastes. As we all know by now, the Chinese are quite queen on luxury and “status objects”. Due to its historical background, western brands and imports no matter the product category, tend to be perceived as luxurious in China. Coffee, which is still considered a relatively “new” addition to the local market is no exception to this. And Starbucks has understood this from the get go. Nothing reflects it better than the price tag: at close to 30 yuan (approx. 4 euros) a 350ml cup of Starbucks Latte coffee in Shanghai will easily cover a restaurant meal for two in a small local restaurant. This reflects how the brand managed to position itself but was that really the only key to local success? After all, coffee is not every Chinese’s cup of tea. So, how did Starbucks manage to become this popular and widespread? My personal view is that, they identified the opportunity as far as positioning is concerned to bring people into the store BUT they kept them in by providing much more. It is this “more” which has allowed them to gain and maintain a clientele far beyond the original appeal of the “novelty” product and brand from the West. So, what exactly was this “more”?They adjusted the offer to the local market’s tastes and culture. Of course, they always kept coffee-based products as the core offer but, often other products seemed more “flexible” (tapioca and bubble teas, seasonal offers reflecting local festivals, etc.) I even noticed variations in the product range based on the store location within the city: some stores obviously had a bigger expat clientele and the offer was adjusted to cater to their specific tastes. By paying close attention to their sales and implementing changes on a store-by-store basis as well as continuously changing the offer to match the seasons, they ensured novelty at every visit, thus keeping customers interested and coming back for more. Second, they offered an in-store experience which spoke directly to the local crowd, one which seeks “convenience” in everything. The store’s infrastructure and design, including the multiple seating configurations (offering the option to chat or work), the air conditioning and, most importantly, the free wifi access all fit perfectly with Chinese preferences. Finally, local success was also ensured by Starbucks’ very strong brand image. Indeed, the standing the brand offers could not go unrecognized by the Chinese market. Add to this, the opportunity to share, via social media, pictures of the consumption process in a nice store location and there you have it: a success story! But, could this one last beyond the novelty stage, I often wondered. Wouldn’t customers eventually get bored of the offer or stores? Granted, the products changed constantly but was that enough? And what about the risk of emerging competitors – both local and “global”? Would customers stay loyal? All of these questions were running through my mind as I approached the new Shanghai flagship store during my visit in May. How far would the brand go this time to please their local clientele – one which is so demanding? Although I had read much about the store’s stunning design and knew this was meant to be the biggest shop yet, nothing could quite have prepared me for just how far the brand would take things this time. So, what exactly has the local market’s specificities allowed the brand to do? First, their positioning as a “luxury” brand has allowed them to create a true unique and memorable flagship store at the same level as big names such as Apple or even Prada. Before even entering the store, the tone is set: “get ready, this is not your average Starbucks!” Located at a key crossroads on one of Shanghai’s busiest and most popular shopping streets: Nanjing Road, the brand clearly makes a mark. By claiming the ground and first floor units of one of the street’s “smaller” malls, Starbucks has ensured two things. One, it looks as if it owns the entire building and as a result as if it actually owns the crossroad. Two, as there are no high-rise buildings or other “distractions” directly behind it, your eye is inevitably drawn to the store. The building’s curved shape and lighting scheme finish it all off perfectly by enhancing the magnitude and grandeur of the store. As you approach the entrance, this feeling of “exclusivity” is further enhanced by a full-on “red carpet treatment” including an usher as well as barriers and railings for potential queues (a common sight at peak hour). To be sure, it feels much more like approaching a five-star hotel or restaurant than a coffee shop. When entering for the first time, one needs a minute to take it all in. The store has been designed to ensure a full view on the entire sales floor. Here, the customer can fully realize just how unique the store’s look and feel is, but also get a first glimpse at its offer range – one which is miles away from that of a “standard” Starbucks outlet. In front of you, a multitude of options abound. On the left, next to the façade, is a first seating area followed by product display furniture highlighting all sorts of branded goods (including clothing and accessories). Directly in front of the entrance is a massive bakery style counter with staff a-plenty making sure customers feel welcome as they enter. Further beyond this counter, you can already discern more counters and seating giving you a sense of an endless store. The real eye-catching element though is located on the right as one enters. Here the space is kept open over the two floors and a coffee “roasting” workshop is put on display so customers can fully appreciate the required craftsmanship behind the product. High tables and stools have even been placed along the balustrade separating the prep area from the sales floor for this purpose. Adding to the differentiation factor of this flagship location, the brand has made use of a completely new palette of finishes. Here, dark wood is combined with brass and leather detailing which do much to elevate the overall look and feel. A toned-down lighting scheme further helps to give the entire space a feeling of coziness and intimacy despite its massive scale. A personal favorite is the ceiling design made from wooden hexagons with cut-outs for the light fixtures finished in copper… detailing at its best! The product displays also add to the overall feeling of luxury by highlighting each individual product as a piece of art. Throughout the store, the brand has clearly highlighted the product preparation process to further enhance the quality appeal. A good example of this is a separate baked goods area located behind glass where multiple “artisans” are hard at work baking all sorts of wonderful treats in a luxurious kitchen, complete with marble work surfaces and a wall full of beautiful iron cast ovens. Beyond this one, customers can find yet another massive counter as well as product display area and another more “intimate” seating area which can be turned into a separate event space. And this is only the ground floor! The second floor continues the full immersive experience and offers even more product differentiation. The first thing to welcome you as you leave the grand staircase is a small reading area – ensuring you feel welcome to stay as long as you want. Upon my visit, this seemed to be “THE” location for those very much sought after “photo-ops” the Chinese are so fond off. And let me assure you, that this store is not lacking in offering opportunity upon opportunity to share the experience with your social media communities. Beyond this space which clearly serves as an acclimatization area, customers can once again appreciate multiple unique product offerings. First, there is another merchandise area integrating décor and lifestyle products. Then, customers can try new products at the cold brew bar. Finally, to complete the offer, a specific counter serving teas has been created. In front of these different elements, seating groups have strategically been placed so customers continuously face the open mezzanine and the beautiful eye-catching elements of the roasting area. Thus, Starbucks ensures they are continuously immersed in the unique coffee experience this store has to offer. Clearly the store’s design contributes a lot to make this store memorable… But what also makes it so appealing is the feeling of exclusivity offered by the multiple new products on offer here. The basic core coffee range has obviously been elevated to push its luxury appeal, whilst the tea offer now benefits from its own specialty area, making it feel much more exclusive. The different baked goods are not the standardized pre-wrapped sandwiches and muffins found in other stores but rather fresh “homemade” delicacies which one cannot help but drool over. Still, for me, what really makes the difference is the non-food offer. Sure, Starbucks has always sold branded mugs and cups, thus selling non-food items is not new in itself, but the range of products sold here is really what elevates it from a “simple” coffee trader to a whole new lifestyle brand. 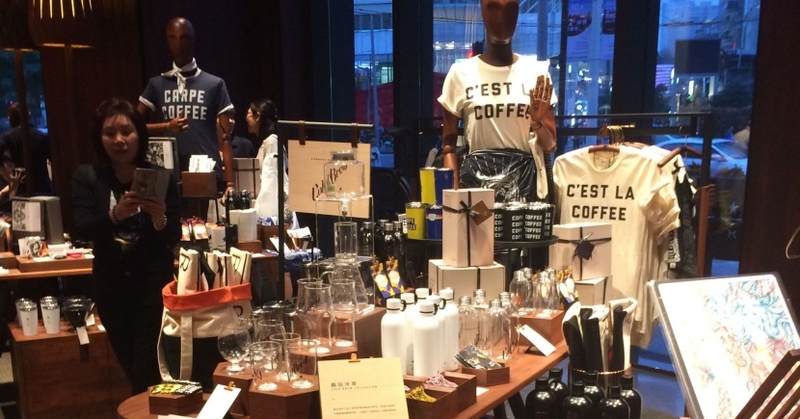 Branded t-shirts, jewelry, bags, purses complement the typical hot drinks accessories ensuring Starbucks becomes a name customers can proudly own as well as showcase. The price tag for these products reflect the brand’s new sought-after positioning, a small purse selling for over two hundred euros. To further support the quality image of these goods, Starbucks has added merchandise by other famous brands such as MariMekko to its offer. This is true genius! By placing their own products next to such a well-established quality design brand, Starbucks further reinforces its new positioning. One which they have been able to adjust thanks to their careful assessment and understanding of the local market’s specificities. Clearly, the brand has made good use of the years already spent in China, as it seems clear to me that the same could not have been done elsewhere. And this is truly what has managed to put an end to all of my doubts about Starbucks’ continued success in China. No, local customers will not get bored. No, the competition will not cause Starbucks to lose its market share. Yes, customers will stay loyal… And surely more will come. Why? Because Starbucks is and hopefully will always be a brand which knows how to listen to its customers and is willing to adapt and adjust itself to deliver to them. They have truly understood the value of going “glocal”: keeping a unified global brand image but delivering to local specificities. Personally, I know I will keep looking out for more examples of the same elsewhere… the future looks exciting! Elisa Servais is a trained interior architect with more than ten years of experience specializing in retail design. Her professional background spans a number of locations, including Brussels, Shanghai and London, as well as structures, working directly for the retailer, as a design consultant, for architectural practices, interior design and creative agencies. In February 2018, she joined the Retail Design Lab, a research group sponsored by Hasselt University as a PhD student. The lab looks into finding ways to best design the store of tomorrow. Elisa’s personal research will focus on “the value of Experiential Retail Environments”.